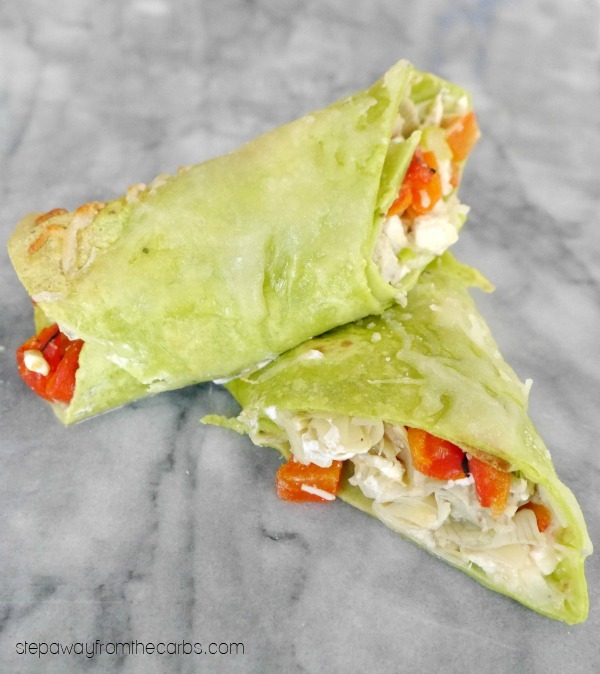 These low carb artichoke wraps are also loaded with feta and red pepper, and served deliciously warm. If you’re looking for a low carb meat-free lunch, try these artichoke wraps! They are loaded with Mediterranean flavors like feta and roasted red peppers, and when they’re served warm they are absolutely fantastic! Drain a small can of artichokes (the can I used was 7oz, then drained to 4oz), and roughly chop. Place in a bowl with crumbled feta, chopped roasted red peppers, shredded Italian blend cheese, chopped green onions. Season generously with salt and black pepper and stir well. 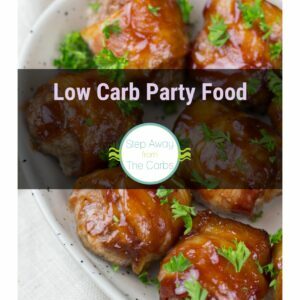 Place two large low carb wraps on a board (I used Garden Veggie wrap from Tumaro’s) and divide the filling between them. Roll them up and place them in a greased baking dish. Bake in a preheated oven for 10 minutes. Sprinkle over more cheese and bake for another five minutes. 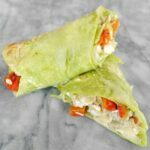 Let the wraps cool slightly then slice in half and serve warm. Place the chopped artichokes, feta, chopped roasted red peppers, half the shredded Italian blend cheese, and chopped green onions in a bowl. Season generously with salt and black pepper and stir well. 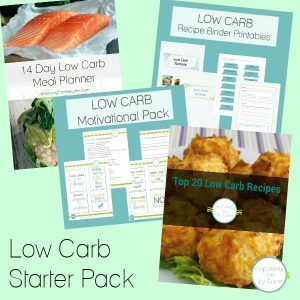 Place two large low carb wraps on a board and divide the filling between them. Roll them up and place them in a greased baking dish. Bake for 10 minutes. Sprinkle over the remaining cheese and bake for another five minutes. What a great lunch idea – I actually ALWAYS have a can of artichokes in the larder… now I know what I’ll be eating tomorrow! Oh nice idea to make it into a lettuce wrap – thanks Stacey! Love those Mediterranean flavors! Awesome lunch or dinner idea! Oh, I love roasted red peppers! This is such a tasty idea!